In the race for first place in the human heart, the Whippet is an odds-on favourite. Neat, sweet, and fleet, these smaller cousins of the ancient Greyhound are tough to beat. Of course, the Whippet was bred to outrun all comers from Day One, so this sleek-coated sighthound already has an unfair head start in the speed department. The exact origins of the Whippet are not known, but it is likely that there have always been compact versions of the Greyhound used for coursing small game such as hares and for hunting vermin. The debate rages as to which hound is the fastest dog breed of all, but the comparison is like stacking the Quarter Horse against the Thoroughbred: Whippets are faster off the mark and excel at short distances and turns; Greyhounds rule over long distances. 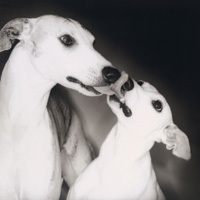 The American Kennel Club (AKC) standard reads: “Temperament: Amiable, friendly, gentle, but capable of great intensity during sporting pursuits.”[emphasis added] In other words, though calm and well- behaved the majority of the time, the Whippet will chase anything that moves and while “on the lure” becomes deaf to owners’ pleas to return. This intensity can bring the dogs into physical danger, as when they pursue a squirrel across a busy road, or tear through a barbed wire fence after a rabbit, so Whippet owners are cautioned to never let their dogs off leash in an unsafe area and to build high fences. 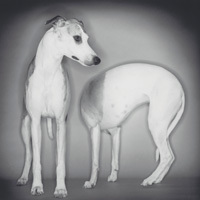 The Whippet’s physique is keyed to its role as a high-performance athlete: long, slim legs, narrow head, deep chest, nipped-in waist, prominent musculature. It’s a striking silhouette, one that inspires overwhelming admiration in some people and instant disgust in others. “Don’t you ever feed that dog?” and “Is your dog sick? It’s so skinny!” are comments that Whippet owners hear all too often. In fact, Whippets are generally healthy individuals with few physical problems. Dogs that race or course may break toes, sprain legs and shoulders, or suffer other injuries, but inherited health issues are few. Like many sighthounds, Whippets can react poorly to certain surgical anesthetics, so owners should be proactive in discussing this with the veterinarian. Being short-coated with very little insulating body fat, however, Whippets do not tolerate cold well, and should never be forced to spend long periods of time outdoors. In many climates, a Whippet will enjoy snuggling into a warm doggie jacket for winter walks. Following the old adage that a good dog cannot be a bad colour, the Whippet’s fine, easy-care coat may be any hue. The AKC standard states simply: “Colour immaterial.” Whippets can be just about anything from solid white to solid black. Common colours include fawn (soft brown), black, and parti-coloured (white with patches of another colour). While colour is wide open, size is closely controlled. The American standard requires males to be 19 to 22 inches at the top of the shoulder and females must be 18 to 21 inches. North American Whippets consider this to be the perfect size for curling into a tight but cushy location on the couch next to their owner, or for sliding under the bedcovers beside a warm human body—although they do make allowances for their British cousins, who are about an inch shorter. Regardless of a Whippet’s speed on the track or in the field, he is sure to triumph as an elegant and easy-going housemate and a loving companion. In this case, the winner does take all: our admiration, our appreciation, and our affection for this, our fast friend. Thanks for your sharing. I have learned a lot of knowledge! I really like your share. Now I want to share <a href="http://www.aubootshopsale.com/">Ugg Boots</a> with you. It is very cute and interesting, Would you like to share more with us ? understand what you are talking about! Bookmarked. Please also talk over with my site =).